Space came so close! to their goal of landing a rocket (in this case, just its booster) on a sea platform. Video from a chase plane showing the final seconds before the first stage of the SpaceX CRS-6 booster touched down on the company's "Autonomous Spaceport Drone Ship" April 14, 2015. The rocket did, for a second time in as many attempts, HIT the barge, but did not stay vertical & fell over. According to company leader Elon Musk, "Falcon landed fine, but excess lateral velocity caused it to tip over post landing." See also this video that details Spacex tailfin landing attempt from back in January. 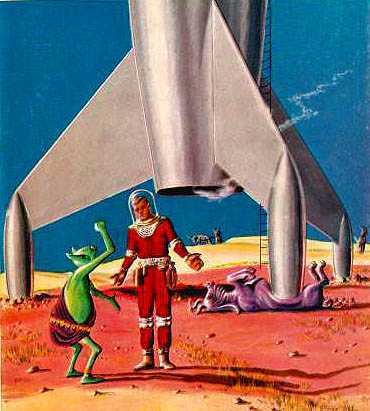 All true sf fans (i.e., old fans) believe that one day spacecraft will be able to take off and land on their tails, just as God and Robert Heinlein intended. Read more about the overall mission at Fourth ULA Launch in Three Months Boosts Latest GPS Block IIF to Medium Earth Orbit.